OCEANSIDE, Calif., February 12, 2019	(Newswire.com) - Sencentric, Inc., a leading provider of real-time, environmental monitoring solutions for the agricultural, food & beverage, and pharmaceutical industries introduces SimpleSENCE, the industry’s most feature-rich, WiFi sensor for detecting water leaks and freeze conditions. 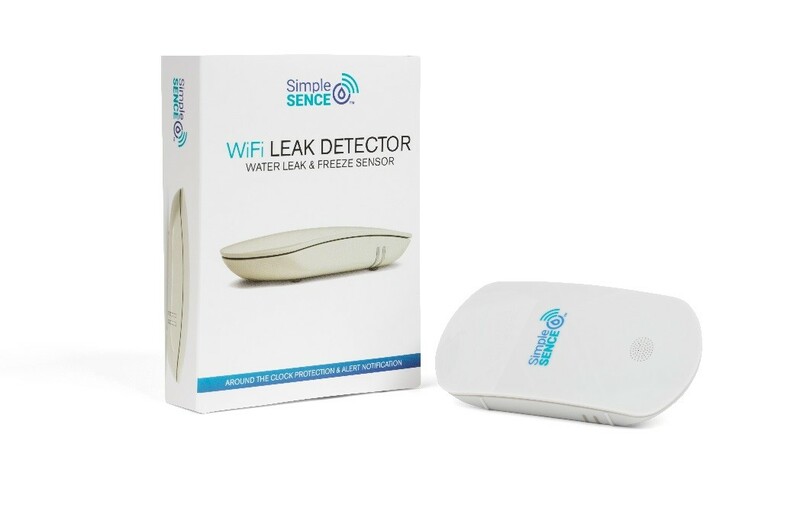 The SimpleSENCE leak detection is the first line of defense for in-home leak and freeze protection, using advanced technology to provide 24/7 monitoring and alert notification to the user’s alert list, anywhere in the world. The standalone and self-contained SimpleSENCE operates via Wi-Fi, connecting directly to a router without requiring a smart-home hub or additional equipment (not to mention no subscription costs). This is a major differentiator, as sensors without a Wi-Fi connection that require a smart hub have proven to be a significant barrier to entry for many consumers. The small yet ergonomic design of the SimpleSENCE detector allows for optimal placement in any leak prone area, even in the tightest spots. Set up of the SimpleSENCE is extremely fast and simple: the SimpleSENCE app provides easy-to-follow, step-by-step instructions. The user can also choose their preferred mode of alert: text, email, or both to their smartphone as soon as a leak or freezing condition is detected. While the user’s smartphone is the primary method of notification, SimpleSENCE also features a loud onboard siren which activates when a leak or freezing temperature condition is detected. The siren will alert anyone in the house when the user’s smartphone is not close by. This function also ensures that a user who is at home will be alerted even when the WiFi connection is down. In addition to warning the homeowner about water leaks, SimpleSENCE also alerts users to freezing temperatures that can lead to further concerns. This is especially helpful in cold weather areas that are prone to bursting pipes. The two-year battery life far exceeds the life of most competitive products, many of which offer just one year. Plus, the extended two-year warranty provides the user with significant peace of mind. SimpleSENCE is available on the company’s consumer products website, www.simplesence.com and sold through Amazon in a 1-Unit Pack ($59.95); plus value-added 3-Unit Pack ($169.95); and 5-Unit Pack ($279.95). Based in Oceanside, CA, Sencentric, Inc. is a leading innovator in the design and development of environmental sensing technology within the logistics and cold chain industries. The company’s success is founded on the principles of innovation, quality, and an unwavering commitment to exceeding our customers’ expectations. Continuing on this core foundation of success, Sencentric is leveraging its state-of-the-art technology in the home protection market with the SimpleSENCE™ home leak detector, providing 24/7 monitoring and alert notification to eliminate potential damage from water and freezing pipes. For more information, visit www.sencentric.com.